New York City has had plenty of powerhouse high school teams for many years, hence the fact that it is known as the “Mecca of Basketball.” But most of the time, the schools that are usually mentioned are the schools in the PSAL (Public School Athletic League) & the CHSAA (Catholic High Schools Athletic Association). However, there is one school in the area that plays in neither league, but has been a great independent program over the last thirty-plus years. The school in question is the Our Saviour Lutheran School in the Morris Park section of the Bronx. The school, which was founded in 1942 is a small school of over 200 students that goes from kindergarten through twelfth grade that has produced plenty of amazing talent for many years. The alumni include Anthel Hicks (Barry University), Danny Tirado (Jacksonville University), Tony Hargraves (Iona College), Arnold Bernard (Southwest Missouri State University), Jamaal Womack (St. Francis College), Nick Murphy and Justin Burrell (St. John’s University). Under the late George Booker, who coached at the school for nineteen years, from 1972 to 1991, he compiled a record of 318-63 and led the Falcons to three New York State Federation championships in 1981, 1983 and 1987. In the 2000’s, under alumnus Oswald Cross, who is now a coach for the New Heights AAU program, the Falcons played against a bunch of big-time programs such as Winchendon Prep (MA), South Kent Prep (CT), St. Thomas More, Crenshaw (CT), Paterson Catholic (NJ) and Oak Hill Academy (VA). In 2007, the school decided to downgrade their basketball program, due to the fact that the program became too big for the school’s administrators. A lot of the promising players could not afford to pay the school’s tuition and so they bolted for other schools, which led to OSL being on the decline for a long time. Fast-forward to the present day. The OSL Falcons are now back on the scene and are thriving as an independent. From 1986 to 2014, the Falcons were members of the Private Schools Athletic Association, winning eight championships in the league during that span of time. But nowadays, the program is in a different direction. 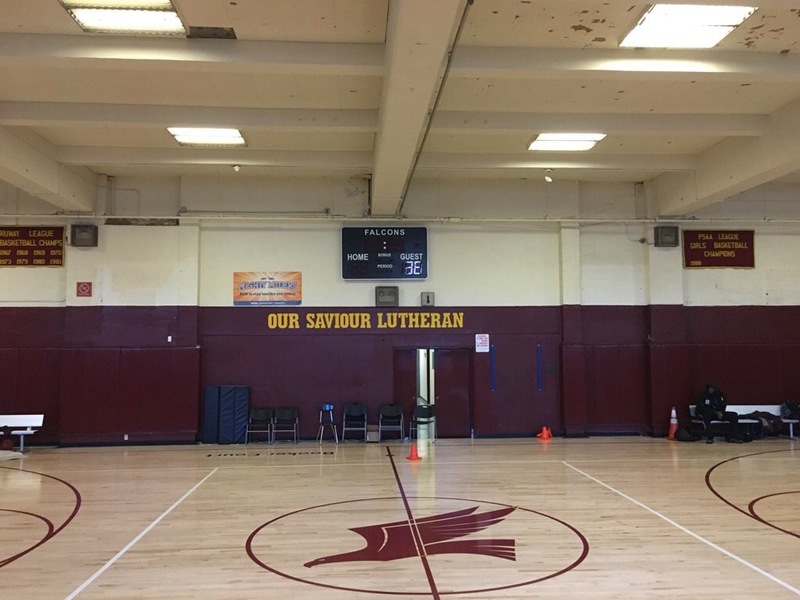 In the present day, Our Saviour Lutheran has two major programs, the high school team, which features traditional high school players from grades nine through twelve, and the post-grad team, who are players that may have already graduated from high school that haven’t had much attention from colleges. Playing for the prep school team gives a player the chance to stay active, play against competition and also gain an opportunity to gain an athletic scholarship. The Falcons are in the huddle. Due to the fact that the Falcons don’t play in any league or are bound by New York State Association rules, they are able to schedule any opponent. Throughout the season, the high school team played against opponents such as The Patrick School (NJ), Neumann-Goretti (PA), Archbishop Wood (PA) and Montverde Academy (FL), St Benedict’s Prep (NJ) and the Ridley School in Canada. Many prep schools are very expensive, including preppy private schools in suburban areas that charge college-level tuition. Our Saviour Lutheran’s tuition in the 2015-16 school year for high school students was over $6,250, which is very affordable compared to other schools. The Falcons during a drill. This year, the post-grad team played against junior colleges and also other prep school teams such as The Robinson School (NJ) and Mt. Zion Prep (MD). So far, Our Saviour Lutheran has gotten plenty of Division I-level talent into the building, such as Jared Rhoden, formerly of Baldwin High School in the Baldwin section of Long Island, who is a part of the Class of 2018. Then there is Queens native Rheaquone Taylor, a senior who is a very athletic player and has plenty of bounce in his game. And last, but not least, a very promising player in Posh Alexander, a freshman from Brooklyn that has plenty of promising talent and plans to be one of the best players in the city by the time he is a senior. “Jared was a low-level Division I player, coming into OSL, we made him lean, we ran him, we did a lot with his upper body, you can see his explosion, he’s playing more above the rim, he’s putting guys on the rim. Posh Alexander, the body tells the whole story. He was spotty with his handle and improved his handle, you see the jumpshot range, he’s shooting NBA threes now,” says Weyhe about his two underclassmen. Rhoden after grabbing a rebound in the game against the Knox School at the Empire Invitational in January. (Photo courtesy of Newsday). “I felt that Coach Six and Coach Pete were going to get me where I wanted to go as far as my recruitment and development as a player. Also, the gym time and the level of competition we play allowed me to get better daily.” says the 6-foot-6 Rhoden about the reason he chose to come to OSL. He now has offers from schools such as UMass, Stony Brook, Rhode Island, Towson, Santa Clara, St. Louis and Loyola-Marymount. The 5-foot-10 Alexander was a very promising player in middle school and throughout his freshman year with the Falcons. He showcased his talent at the Jordan Brand Classic Global Showcase at the Barclays Center, in his native Brooklyn. In the game, he scored 13 points and added six assists and led the Blue team to a 123-86 victory. Playing for the New York Lightning this spring on the Nike EYBL circuit, he has averaged 7.5 points and 2.3 assists per game. Alexander pushes the ball around in a game against Archbishop Wood in Philadelphia. (Photo courtesy of Bucks Local News. When asked about why he came to OSL, he replied, “What I like about the basketball program is the competition we played. I see OSL being the top school as it keeps growing.” At the present time, he reportedly has offers from Stony Brook and St. John’s, but as he continues to thrive, expect more offers from this rising star in the future. When asked if OSL was a great alternative to a prep school, he replied, “Yeah, it’s a great alternative. I could have went anywhere else, I could have went to school in Virginia, I could have went to school in Connecticut, but I wanted to stay home in New York, knowing that I wanted to bring my city back, I knew it was dying, so for us to have a prep school in New York, why not go and help build that? So the future kids will want to come here and we’ll be on top again.” Taylor will graduate from OSL this spring and will be headed to Hutchinson Community College in Kansas in the fall, and will help them defend their NJCAA Division I national championship. Courtesy of STSF Sport Films.